materfamilias writes: Counting Down . . .
Wind warning in effect so our Christmas travellers (two daughters, two partners, one granddaughter) will have a rough trip over on the ferry later this morning -- when we rode over on Tuesday, we were accompanied for a short while by a pod of orcas, but I suspect today's voyage might not be quite as pleasant. Still, they'll all be off work and school for a few days, in each other's company travelling home for Christmas, and no more shopping or wrapping or baking to do. Ditto for my son and his partner driving up from Victoria this afternoon. And for my middle daughter and her partner, flying the wrong way (to Toronto and then driving onward) to celebrate with his family. Leaving responsibilities behind. Anticipating good food and beloved company (perhaps the occasional squabble, yes, but generally we'll have good times). I'm not quite there yet, since we're the host-parents -- the pudding's been steamed and most of the groceries bought (wonderful Pater, thanks! ), but no ground pork at the store yesterday so the tourtières have to wait 'til today's run. Meanwhile, I think I'll put together the trifle while Pater's out picking up groceries and Group #1 from the ferry -- all their gear will get thrown in the wheelbarrow which may have to double as an ark -- it's pouring and pelting and soaking out there. Lots of mud thrown in for good measure. Which will all have the benefit of making the fire and the tree and the lights that much more welcoming when they finally arrive. I finished up the third pair of socks I was knitting last night, then darned in all the ends, soaked and blocked -- they'll all have to dry before I can wrap them tomorrow. Still hoping to finish up a wee cardigan for Nola, but it might just wait 'til after the chaos clears. So much better if I could finish wrapping the gifts so that I can simply bask in the real presents -- my family's presence. I have one more pre-Christmas post to finish -- it`s one I began writing last year and never finished in time. I hope you find time to come back and read it -- I hope to post it tomorrow, a story of my most-memorable Christmas gift ever. If you`re too busy with family, well, good for you! (it will still be there for your reading afterwards, after all, when the gifts have all been exclaimed over, the turkey enjoyed and its carcass turned to soup, the last set of linens stripped from the beds, laundered, and folded back onto their shelves). 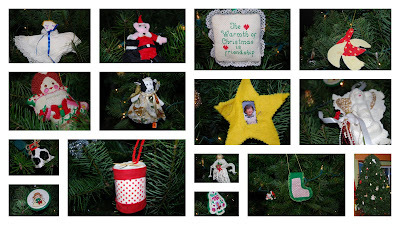 in case anyone's interested, the collage above comprises photos of our tree and its ornaments. I can't help feeling a bit sentimental about that calico-red dove and the polka-dot drum, both made by my 21-year old self to furnish our first Christmas tree. Later, those embroidered felt ornaments, the yellow felt stars with my children's photographs, cross-stitched Christmas wisdom from friends. My tree is an archive -- but not a dusty one! Can't wait 'til Nola sees it! It all sounds lovely, especially coming in from a blustery day to fire, tree, treats. Your ornaments are charming! I look forward to reading tomorrow's post. Have a wonderful, warm holiday with your family! Where do you get all that energy from! So much to be done, so much done already. The ornaments are treasures, great ones! I dream of your life. Which I know is real, and not perfect, nothing is, but sounds so wonderful from here. The warmth of home and family is much treasured on such a blustery day. Surrounded by love you're sure to have a wonderful Christmas. Good morning! Found your blog through Hostess of a Humble Cottage. I live in the Comox Valley, and from your post, it sounds like you live on the Island too. I, too, am a knitter. But did little knitting as gifts this year. I am knitting for my great grandchildren (putting away, as my GDs are only 20 and 17). Little gifts take less time, unless it is nearing the gifting hour. What beautiful ornaments! And I've been having so much fun this season, carrying around the "Christmas is now" philosophy. I'm drinking wine at 1 pm, sewing until I decide to stop, thinking of cooking (but not quite getting there), watching Julia Child episodes on DVD. Of course, there's some drudgery and my foot lets me know when it's unhappy, but my mood is relaxed, which is everything! mater you have been busy getting ready for the family...and all sounds wonderful. I've just picked up my free range bird, what a long line up at the Butchers..they were serving treats to keep us happy while we waited. If Isla will wear it...Grammy will knit it! When your child is not there, always a pang, Hope it will be flying the right way for her family, at least. Always a juggling act to divide visits over the holidays. Merry Christmas, ma, and thank you for each and every post. Pseu: Sounds as if you've been getting more than your fair share of blustery weather down your way -- stay dry! Metscan: I have to say I'm a big believer in the power nap for energy! LPC: It's very real, and so not perfect at all, but I feel very blessed. Lorrie: Hasn't it been stormy! Best weather for cuddling a new grandbaby -- enjoy! Peg: Welcome! Thanks for visiting and for commenting . . . I like plugging away at those smaller knitting gifts -- it's always pleasing how the pile builds up over the year to yield a bounty of Christmas presents. Dreaming of great-grands, eh? Imagine . . .
K: I'm thrilled to take any credit I can for inspiring wine in the early afternoon . . . Christmas is now, enjoy! Hostess: Cables are much easier than they look -- you'll have Isla beautifully kitted out in gorgeous gramma handknits -- be sure to show us as the project takes shape. Duchesse: We've been very fortunate to have at least three of our four home each Christmas -- and I feel pretty strongly that the other family should get to share that pleasure. But I doubt I'll ever get over worrying just a bit when one of mine is in transit somewhere. . . Merry Christmas to you and yours as well.